Thanks to Gene Martel on Flickr for the tasty photo. – The Collins Pub 5th Annual REAL Strong Beer Festival has been moved up a few days and will kick off today and last through the end of the month. Look for beers to be rotated in as kegs kick and space becomes available. It’s defintiely going to be worth going in multiple times. Vintage offerings will include a cask of 2007 Bourbon Barrel 9MM Strong Ale from the now defunct Heads Up Brewing, 2004 Tombstone Barley Wine from Winthrop Brewing, and a 2007/2008 vertical of Deschutes The Abyss. They will also have two exciting new releases from Russian River Brewing Company. Pliny the Younger (Pliny the Elder’s strong nephew) is a triple IPA that weighs in 11% ABV and Consecration is the newest barrel aged beer from the brewery. – I wandered into Uber Tavern last night at the right time. They were just tapping one of the few kegs of the new batch of Full Sail Black Gold Bourbon Aged Stout. Yum. They also had the wonderful Cascade Mouton Rouge and my favorite light session beer, Schlenkerla Helles Lager, on tap. Oh yeah, and some beer called Blind Pig IPA from Russian River that I kind of like (just a little). A few of us also shared a bottle of Saint Somewhere Lectio Divina. Definitely worth trying this Belgian-style strong ale brewed in Florida ($16/750ml bottle is actually pretty reasonable). Tasting and Celebration of 10 years of serving the Northwest Beer Community. We will be releasing Both versions of Bottleworks 10 at 11am when the doors open. New Belgium Bottleworks 10th Anniversary Wild Ale – 750ml $20 first day only. Click Distributing, and the Toronado. Hair of the Dog Matt – 12oz. $15 first day only. The base beer is Hair of the Dog Adam and will have aged in bourbon and 33-year old Apple Eau de Vie barrels for approximately one year by the time it is released. Along with the 2 versions of the 10th anniversary beer we will be releasing 10 years worth of cellared surprises including Bottleworks 6th anniversary by Far West Brewing. Come celebrate 10 years of Bottleworks all night long until the bar closes. As soon as the Matts walk in the door (sometime between 7pm and 8pm), we will tap the following special Bottleworks kegs. We will also be pouring Bottleworks 6 from Far West by the glass from the bottle. 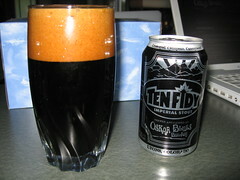 – New beer arrivals to keep your eyes out for: Oskar Blues Ten Fidy Imperial Stout (yes, in a 12oz can), Snoqualmie Spring Fever (one of my favorite spring seasonals), Russian River Pliny the Younger and RR Consecration should be around town early next week it sounds like, Great Divide Espresso Oak Aged Yeti (awesome) and Great Divide Claymore Scotch Ale should be in stores any day now. Not a complete list of new arrivals by any means, but these were just a few that came to mind. – A couple of people on Ratebeer entered ratings for an oak version of Elysian’s Night Owl pumpkin beer. Not sure if it is still on tap, but I’m hoping to find time to stop by the Capitol Hill location and find out. – The folks over at the Washington Beer Blog stopped by the new Georgetown Brewing Company location, and here is a link to their informative post and some nice photos. Congrats to Georgetown on their expansion! – If you haven’t seen it in the news, Oregon is faced with the possibility of a large increase in beer tax. Here is a good editorial on the issue from the Oregonian. The level of this tax increase seems very extreme, and I agree with the editorial that it would make sense for the beer industry to work with lawmakers to come up with a much more modest and reasonable tax. According to this article, the beer tax in Oregon is currently one of the lowest in the country and was last raised in 1977, so it may be about time for a little something. But, at this current level of increase it sounds like the proposition is unlikely to pass through the legislature. I got the chance to try the Oaked Night Owl. Worth drinking for sure. A little mellower in the spice-end of the regular night owl. That Full Sail Stout is liquid awesomeness. Between that and the Blind Pig, you were drinking extremely well. Not sure where you got your tap list for Collins Pub this year, but about half of the things you said they’d have, they didn’t have. They didn’t have a 2007+2008 vertical of The Abyss (and when I asked if they intended to have it they said no). They didn’t have 9MM Strong Ale, unless I missed it somehow. They *did* have Pliny the Younger, but they said it ran out in one day (on Friday I think). I went on Thursday and Saturday and was a little disappointed that it seemed a bit less well organized this year. The printed strong beer festival menu was not up to date (it was last year’s I think) and they were telling people to ignore it and instead check the chalk board or tap handles. Nevertheless, I still enjoyed some great beers. Patrick – I got that tap list info from Seth (the owner) about a month back. It runs all through this week, but I can’t vouch that what he told me will be on tap actually will be. I missed out on the Pliny as well…but I’m hoping to find it somewhere else around town this week. If not, it will be back in the future I’m sure. Ah, thanks for the response. I saw Seth around on Thursday but didn’t talk to him. If they had Abyss 2007/08 on tap that’d be really fantastic. Maybe the bartender I spoke to got it wrong and they’re adding it later this week.